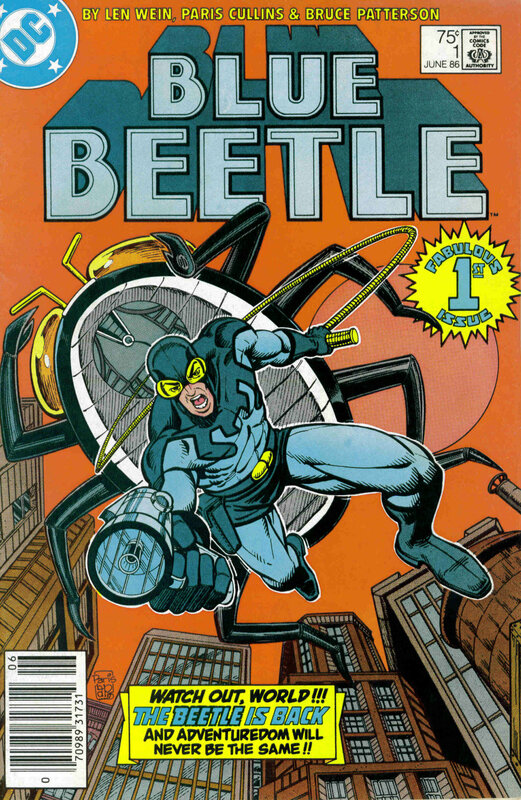 I like the Blue Beetle. « Another day. More pounding of the keyboard. I like the Blue Beetle. And, no. I don’t mean a car. I mean this guy. This guy is Ted Kord. He’s the second of three Blue Beetles in the comics world. The guy before him had a magical object that gave him powers and the guy after him had a thing that gave him magical powers. Ted didn’t have magical powers. It’s why I like him. There’s a couple of reasons WHY. He’s this guy–ok, a wealthy, tech savvy guy–who decides to be a hero because it’s the right thing to do. There’s no mission to avenge the death of mommy and daddy (Sorry, Batman…seek therapy.) He’s doing it to continue the mission of doing the right thing. And then… you know, he’s not that GREAT at it. He’s no Batman, that’s what I’m saying. (But, then Batman DOES need so therapy…) Ted Kord does his best. Which is better than I can do. But, he’s not the best of the best. He’s good. Sometimes he’s great. And I think that’s what I love about him. He’s a fallible human being trying to do his best in a world of super powers. He’s this smart guy who has willed himself to be a hero. And he does it with humor. Simply put he LOVES his job. And that’s compelling reading for me. A guy struggling not only against the bad guy, but against his OWN LIMITATIONS. It’s why I liked McClane from Die Hard. Here’s a guy in a crappy situation, NO SHOES, who has got to fight off the bad guys. He’s not the best of the best. He’s not Stallone. He’s not Schwarzenegger. He’s an average joe who rises to the occasion. That’s compelling. Because that could be me. Or you. Well. I HOPE it’s me. I hope I could rise to the occasion. I’ve never been a big fan of Stallone or Schwarzenegger because they seem totally prepared and super capable of responding to a situation. Generally with a bigger gun. So… who cares? They are “the best of the best.” Blah blah blah. I mean, they are practically bullet proof. It’s why I’ve never been a big fan of Superman. Or Batman… given enough time he can defeat anyone… Meh. Perfection is cool. But not compelling. It’s not ME in the comic or in the movie. It doesn’t make me want to buy their action figure or buy a t-shirt. I like the hero that probably won’t normally BE a hero. If the circumstances were different, they would quietly do their job. But circumstances come to them. And they look around and realize, holy crap, someone’s got to do something about this… Oh, I guess that’s me. How do I do this? I’ll leave with this final thought about Ted Kord. In his final story (yes, sadly, Ted’s gone), Ted has discovered a conspiracy. A deep dangerous conspiracy that could turn the whole world upside down. Now, by this point in his life, Ted was considered a bit of a joke to some of the other heroes. He wasn’t taken seriously. To much laughing, to many jokes, some weight gain (he IS like me), and some screw ups had tarnished his reputation. Wonder Woman wouldn’t listen. Superman wouldn’t listen (and you would think with his super hearing), even Batman wouldn’t listen. But, Ted knew he was right. So he kept following his leads, until it led to the conspirator. And, a bullet. To the head. Ok, so it didn’t always go so well for him. But Ted kept going…and that’s why I find him compelling.